As the Independence Day comes closer, many Indians are joining the green pledge to make India’s future green. 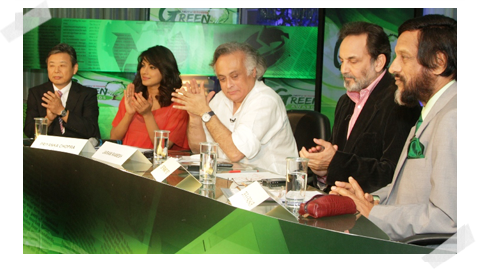 Joining in the green wagon is Bollywood sizzling actress Priyanka Chopra, who has agreed to become the national green ambassador for initiating eco-friendly campaigns across the country. The announcement came from our die-hard Environment and Forests Minister Jairam Ramesh during a recent conference in the capital. A day after the announcement, Priyanka Chopra launched her official website with some green touch. “Finally launching iampriyankachopra.com! It’s my official website which is totally interactive and everything me”, said the actress with excitement and hopefully she will use this platform to interact and share green initiatives, tips and information with her fans and friends alike. In addition to Priyanka Chopra, actor Aamir Khan has been roped in by the Union Tourism Ministry in order to reinforce the image of “Incredible India especially ahead of the Commonwealth Games. The actor can be seen on TV imparting lessons in hospitality and civic sense in line with the age old phrase ‘Atithi Devo Bhava’. Since environment and social campaigns like these need people with credibility, someone who people look up to and listen to, hence our Bollywood actors and actresses make excellent candidates for the cause. From the environmental fraternity, the Intergovernmental Panel on Climate Change (IPCC) chief Dr. R.K. Pachauri tried his best to encourage Priyanka and told her, “You must be a part of the national movement for river cleaning, so that one day we can swim in the Ganga without any pollution.” Well, as a concerned citizen of this country I believe many will like to join and be a part of such a great initiative which could eventually revive a dying river like Ganga and other rivers in the country. Can you imagine swimming in the Yamuna that flows right across the capital city? Ms. Chopra your support for Green initiatives and River’s is great. Apprecitate your concern’s for fellow beings (UNICEF great) be it nature or human. Great, keep up the spirit. My Mistake 🙂 I should take a break now.